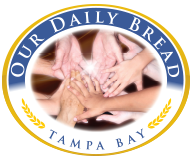 Our Daily Bread delivered approximately 1,500lbs of donated food to benefit Be-COS, Inc, contracted by the Salvation Army Tampa to provide warm meals to the residents of their Emergency Shelter and Transitional Living facilities. The generous owners of Fountain Square and The Patio restaurants on Davis Island donated 26 cooked turkeys and all side dishes to enable families in need in Tampa Bay to have a wonderful Thanksgiving Dinner. On Thanksgiving morning, Our Daily Bread Tampa Bay volunteers picked up the dinners at the restaurant and delivered everything directly to the homes of different Salvation Army families in need. We want to take this opportunity to extend a heartfelt Thank You to our generous new community partners Fountain Square and The Patio restaurants on Davis Island. We hosted a food drive at the different locations supported by our Community Partners listed below. In total we were able to collect around 1,500 lbs of food donations in support of Be-Cos Inc.